Violance proceeds from the search for a new scenic and musical form, merging instrumental writing, images, texts, and sounds transformed by computer. This piece belongs to the Reality Checks cycle, which includes interactive installations, scenic forms, and concert works. These pieces are constituting investigations, through sensitive forms, about the questions of identity and representation at the digital age, as explored and renewed through the writing of dynamic interactions between artistic disciplines in the creative work with computer. This cycle includes, among others, a piece for cello and electronics, Cellitude (interpolation between « solitude » and « cello »), starting from an old japanese poem on the difficulty to split dream and reality. Violance is its continuation by spirit, this time concerned with the idea of « violence ». discribed in The Gospel according to Matthew (II, 16-18), painted by Pieter Bruegel the older (around 1566, today at the Kunsthistorisches Museum of Vienna), as well as the less known litterary interpretation of this painting in 1886 by Maurice Maeterlinck, then a young poet (cf. M. Maeterlinck : Introduction à une psychologie des songes et autres écrits 1886-1896, Collection Archives du futur, Editions Labor, Bruxelles, 1985). I have adapted this text to develop its universal dimension, outside of any religious and nationalistic context, and unfold its span for all times and places. These materials are staged, assembled and processed together with other sources from various origins, to propose with Violance an enigmatic re-reading, a « mise en abîme » altogether of the myth, the painting, and the poem, which attempts to be an intemporal reflexion on representation of violence and war. A timeless african lullaby was analysed with Audiosculpt and OpenMusic programs, to produce melodic interpolations for the violin part, and harmonic textures for the electronic part. 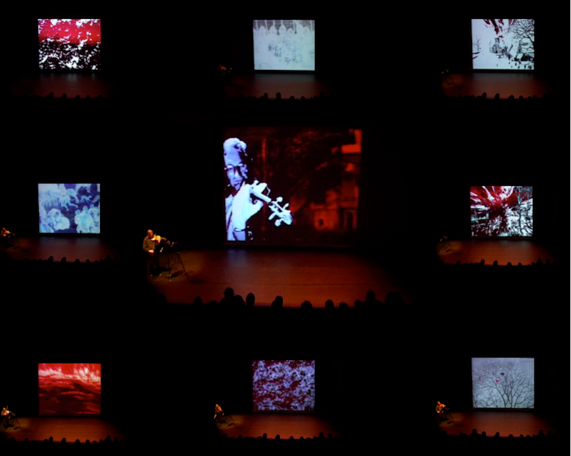 These materials were then used with "Models of Resonance" (dynamic filters) in Max/MSP program to synthesize the harmonic textures, which are played together with the processing and spatialization of the violin or flute playing live on stage. The child voice recitating the text (in the french version), has been totally recreated from a woman voice with AudioSculpt and ProTools, in order to control its precise intonations and timbre. The visual part is composed of materials prepared with Final Cut Pro and After Effects, triggered and processed together with live cameras sources through Isadora. Though the original version was made in french, an english version, and a german version do exist, and can be performed live. Commissionned by the French Government; coproduction: Gmem/Image Auditive; premiered at Théâtre de La Criée (Marseille), May 2003.